New means kainos in Greek, ie new, unused, fresh, novel, new in regard to form or quality . . Christ’s love now controls us! (verse 14), but as it says in 2 Cor 6:1 don’t accept this marvelous gift then ignore it! We will bring peace in situations and we will have peace, we will see healing and know God’s healing hand continually at work in our lives bringing wholeness, our doing will often be in Joy, we will see joy restored in others, we will be encouraged as we encourage. As we partner with God, life will seem brighter, more positive. A thankful heart will keep us in a state of knowing how blessed we are and how much we are blessing others. 11 Because we understand our fearful responsibility to the Lord, we work hard to persuade others. God knows we are sincere, and I hope you know this, too. 12 Are we commending ourselves to you again? No, we are giving you a reason to be proud of us, so you can answer those who brag about having a spectacular ministry rather than having a sincere heart. 13 If it seems we are crazy, it is to bring glory to God. And if we are in our right minds, it is for your benefit. 14 Either way, Christ’s love controls us. Since we believe that Christ died for all, we also believe that we have all died to our old life. 15 He died for everyone so that those who receive his new life will no longer live for themselves. Instead, they will live for Christ, who died and was raised for them. 16 So we have stopped evaluating others from a human point of view. At one time we thought of Christ merely from a human point of view. How differently we know him now! 17 This means that anyone who belongs to Christ has become a new person. The old life is gone; a new life has begun! 6: 1 As God’s partners, we beg you not to accept this marvelous gift of God’s kindness and then ignore it. Will this make you happy? . . actually there is a difference between happiness and joy. I pray that thinking on this Psalm will make us joyful, perhaps it will make us happy too! I led the worship at St Mellitus College NW on Monday morning and we looked at Psalm 126. The amazing new translation below is by Brian Simmons. I have ordered serveral copies for Christmas presents. Look where we have come from! See others and ourselves, stepping into our destiny! Think where you have come from! Without Christ you could be proper messed up, dead even! I know someone like that, now rescued when they cried out to God. At one point in their lives they were kidnapped at gun point! And this same person, just like you and me, now has a unique destiny, a special purpose to fulfill. When we see this destiny working out in our lives and in the lives of others it makes us rejoice and praise God! Even if, in our own lives, we are wondering what God is up to and we can’t see any evidence of that destiny, we can still know and be sure that God is working out His purposes for us! We are weeping as we sow because our children are at home starving. 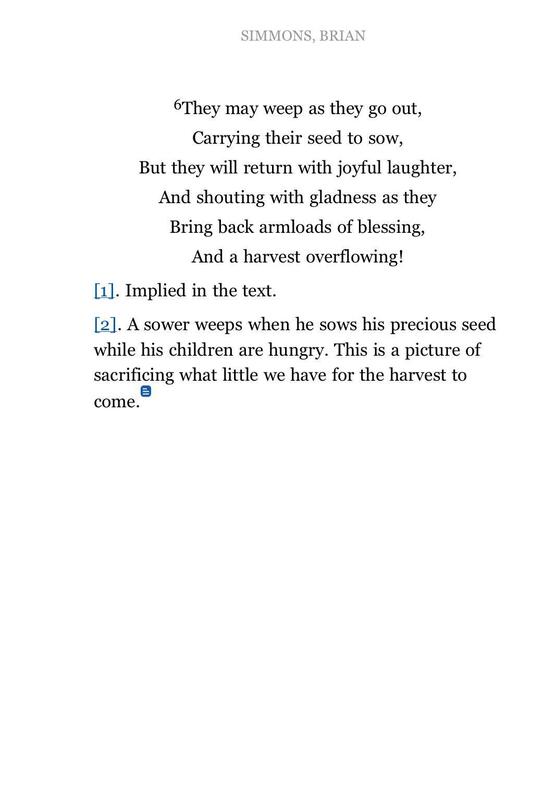 We are sowing the last of all the seed we have! This seed could be used to make a last meal of bread at home or it could be sowed. The challenge to us is: Are you making bread at home or are you sowing. We are ALL called to sow, not just those recognized as ‘Evangelists’. Bless you and may our hearts be full of joy today as we seek the harvest! Join giffgaff for £5 a month http://giffgaff.com/orders/affiliate/andiharper and help me out!